Right now, the immediate focus related to the NASCAR Sprint Cup series surrounds the 2014 Chase. 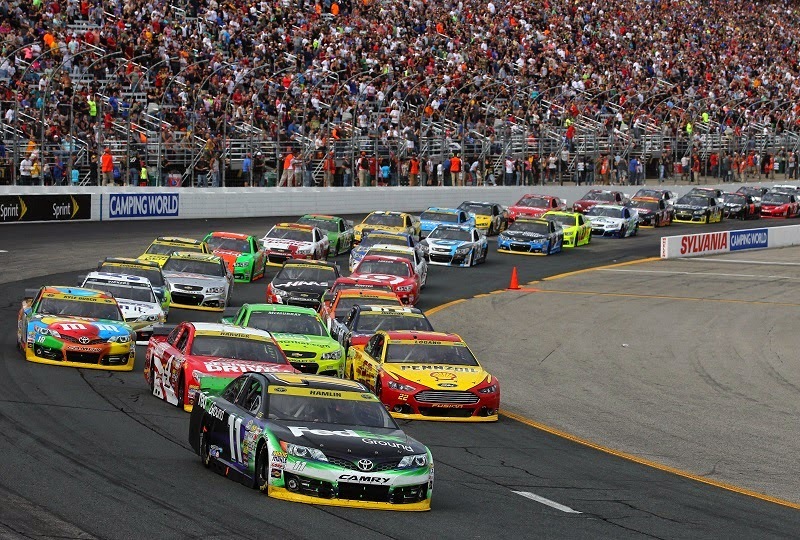 However, with eight races remaining in the 2014 season, NASCAR announced a series of rules changes affecting the way the 2015 race cars will be prepared for competition. For the 2015 NASCAR Sprint Cup season, the Chevrolet, Ford and Toyota race cars will most notably feature less rear downforce as well as less engine power. Trimming the rear spoiler on this year's car by two inches, the 2015 height for the aerodynamic accessory will be a maximum of six inches. Power for the V-8 engines propelling Sprint Cup cars is being reduced for the upcoming year with the use of a so-called tapered spacer (the same device used on NASCAR Nationwide and Camping World Truck Series vehicles). Adding the tapered spacer, performance output available from the powerplants of 2015 cars is predicted to circulate around 725 horsepower. Other technical revisions for 2015 includes brake calipers, an altered radiator pan width and the reduction of the overall weight of the NASCAR Sprint Cup to 3,250 pounds without the driver (down by 50 pounds more than 2014 rules). Another major addition for 2015 places more handling control in the hands of the driver. For the 2015 NASCAR Sprint Cup season, drivers and teams can choose to install optional onboard adjustment tool for the track bar. Teams have long exploited the track bar for dialing in the on-track performance of the stock cars on the tour but it had existed only an adjustment that could be made during pit stops. The driver-controlled track bar adjustment tool will be available as an active tool that could take work off the hands of pit crew members and provide competitors with quicker tailoring of the vehicle's track performance. At this time, one of the only other adjustments available to a driver inside the race car is brake bias. Changes for the NASCAR Sprint Cup series will not be limited to the cars for 2015 There will also be a number of changes made to the sporting and operations of Sprint Cup series. Destined to affect teams the most is the ban of all private track testing. This measure is seen as a measure to reduce costs and to prevent advantages gained by the higher-funded organizations on the Sprint Cup tour. Teams will be invited to take part in NASCAR-sanctioned tests or Goodyear tire tests only. NASCAR also noted that there will be no test at Daytona International Speedway ahead of the 2015 Daytona 500. The NASCAR Sprint Cup series will also introduce the group qualifying format that debuted this season at all tracks for 2015 including its implementation at the Daytona 500. At the road course of Sonoma and Watkins Glen, series tire supplier Goodyear is providing fans the chance to watch a race even in wet conditions. The Akron, Ohio tire company has pledged to create rain tires for Sprint Cup road races. Used more often in the NASCAR Nationwide series in past seasons (including the last race at Road America), Goodyear's rain tires have never been used in a Sprint Cup main event. Additionally, NASCAR Sprint Cup cars will be required to run windshield wipers, window defogger system and a red rear marker light in preparation for wet weather racing. These changes are the highlight of a total of 60 enhancements made to the 2015 NASCAR Sprint Cup car rules for 2015.